A "proven" 7º slant design allows a natural feel and body movement. 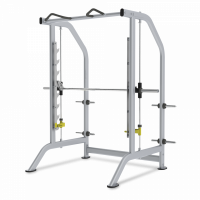 Heavy weight half rack system with integrated safety stoppers. Features spring loaded/swing lock J-Hook (Pat. Pend.) design for easy adjustability. 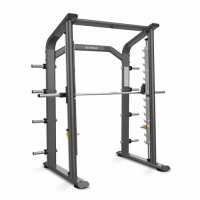 Standard with built-in chinning bar, dip handles, Olympic bar holder and weight plate storage. 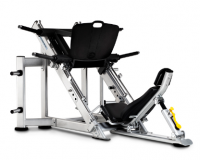 Unique 2-in-1 design allows seated leg press and prone hack squat positions off same machine. 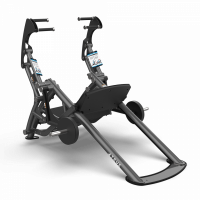 Seat carriage with commercial grade linear wheels riding on 2" nickel plated support rails provide optimal path of travel throughout the range of motion. 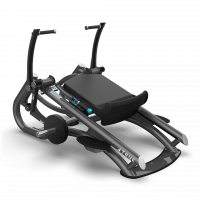 Dual foot plates provide space for a variety of foot placement options and target muscle isolation. 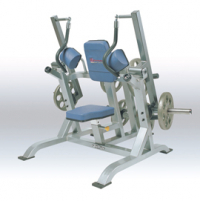 Direct belt linkage weight load allows precise pressing resistance.